The offline-only, formerly Canada-exclusive Wii Mini is hitting the UK, along with some new Nintendo Selects. Last December, more than six years after the Wii launched, Nintendo released a slightly smaller version of the console and called it the Wii Mini. The miniature version of Nintendo's system had no online functionality, no GameCube compatibility, and it was only available in Canada--but hey, at least it came with a nifty red Remote Plus and Nunchuk. 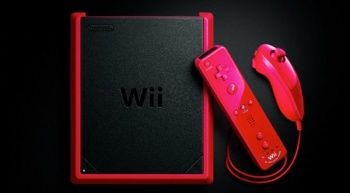 Starting next month, gamers in the UK can get their hands on those sleek red controllers, along with the entire Wii Mini console, because Nintendo is bringing it across the pond. To celebrate, Nintendo is adding several first-party titles to its value-priced Nintendo Selects line-up: Mario Party 8, Wii Sports Resort, Mario Power Tennis, and Super Paper Mario. These games are scheduled to be available with their new pricing "in time for the launch of Wii Mini," making it easier for the handful of consumers who never picked up a Wii to catch up on the console's library. Nintendo didn't announce a UK price for the redesigned console; it launched at $99.99 in Canada last year. The Wii Mini will be available in the UK on March 22.